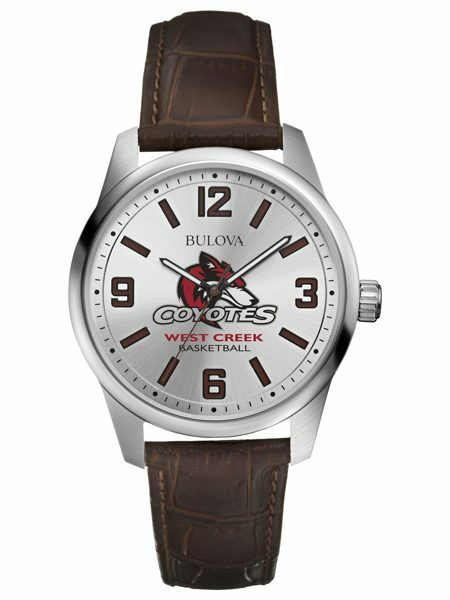 Bulova Custom Logo Watches are perfect for Championship Team Recognition, Client Gifts, Senior, Letterwinner & Participant Awards, Staff & Employee Gifts, Safety & Service Awards. Round silver dial with Arabic numbers Sweep second hand Silver-tone bezel Case size: 38mm Black leather strap Available in matching women's size Bulova and Caravelle by Bulova custom dial faces are pad printed directly by Bulova factory, which ensures the highest quality reproduction of your logo. Don't settle for inferior digitally printed dial faces, which can fade and peel over time. Click here to learn more. 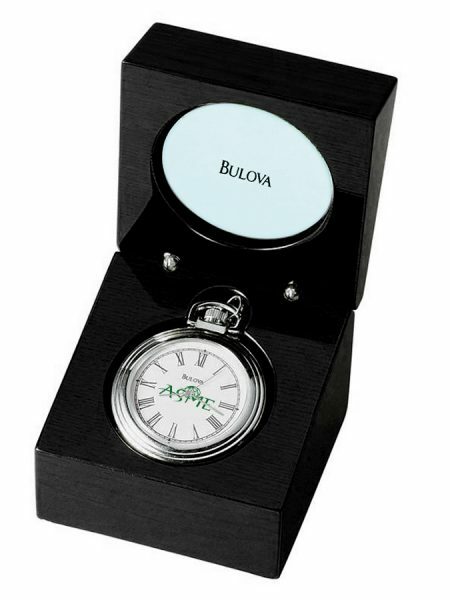 Round silver dial with Arabic numbers Sweep second hand Silver-tone bezel Case size: 30mm Black leather strap Available in matching men's size Bulova and Caravelle by Bulova custom dial faces are pad printed directly by Bulova factory, which ensures the highest quality reproduction of your logo. Don't settle for inferior digitally printed dial faces, which can fade and peel over time. Click here to learn more. 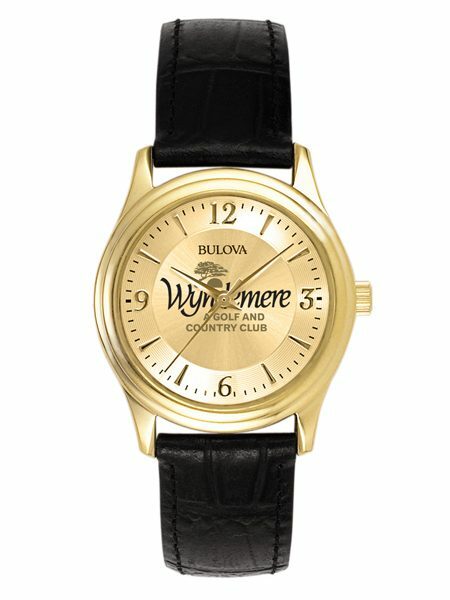 Round gilt dial with Arabic numbers Sweep second hand Gold-tone bezel Case size: 30mm Black leather strap Available in matching men's size Bulova and Caravelle by Bulova custom dial faces are pad printed directly by Bulova factory, which ensures the highest quality reproduction of your logo. Don't settle for inferior digitally printed dial faces, which can fade and peel over time. Click here to learn more. 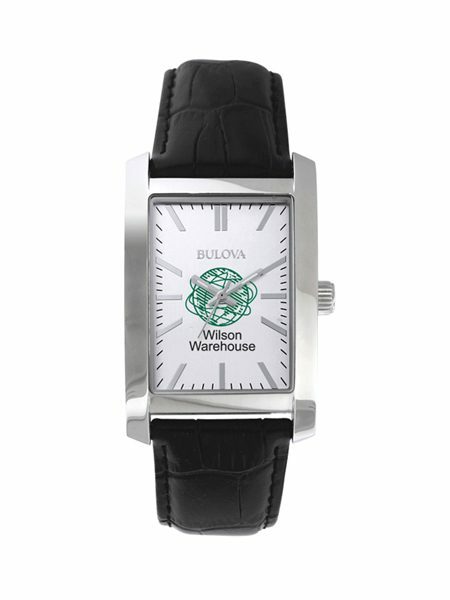 Rectangular grey dial with stick markers Sweep second hand Silver-tone case Black leather strap Available in matching women's size Bulova and Caravelle by Bulova custom dial faces are pad printed directly by Bulova factory, which ensures the highest quality reproduction of your logo. Don't settle for inferior digitally printed dial faces, which can fade and peel over time. Click here to learn more. 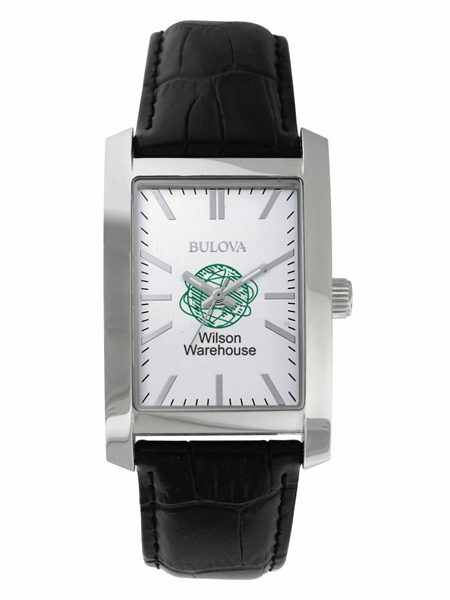 Rectangular grey dial with stick markers Sweep second hand Silver-tone case Black leather strap Available in matching men's size Bulova and Caravelle by Bulova custom dial faces are pad printed directly by Bulova factory, which ensures the highest quality reproduction of your logo. Don't settle for inferior digitally printed dial faces, which can fade and peel over time. Click here to learn more.FREE set-up charge. Above price includes TWO imprint colors. Please add UPS shipping. Round silver dial with Arabic numbers Sweep second hand Silver-tone bezel Case size: 40mm Brown leather strap Available in matching women's size Bulova and Caravelle by Bulova custom dial faces are pad printed directly by Bulova factory, which ensures the highest quality reproduction of your logo. Don't settle for inferior digitally printed dial faces, which can fade and peel over time. Click here to learn more. 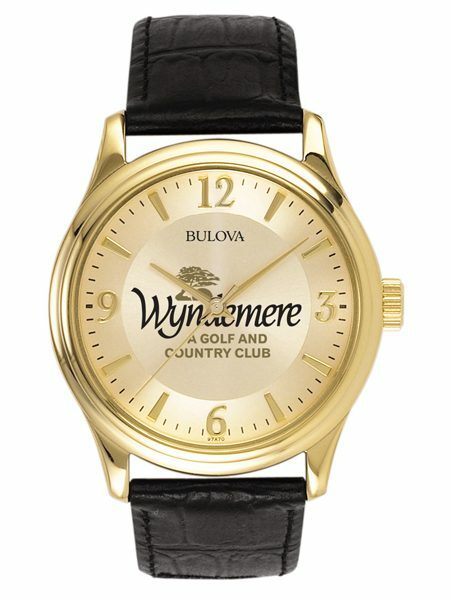 Round black dial with one diamond Sweep second hand Gold-tone bezel Case size: 38mm Black leather strap Available in matching women's size Bulova and Caravelle by Bulova custom dial faces are pad printed directly by Bulova factory, which ensures the highest quality reproduction of your logo. Don't settle for inferior digitally printed dial faces, which can fade and peel over time. Click here to learn more. 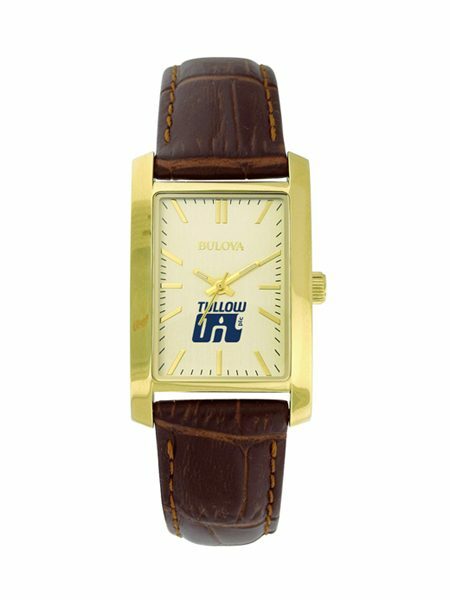 Rectangular champagne dial with stick markers Sweep second hand Gilt-tone bezel Brown leather strap Available in matching women's size Bulova and Caravelle by Bulova custom dial faces are pad printed directly by Bulova factory, which ensures the highest quality reproduction of your logo. Don't settle for inferior digitally printed dial faces, which can fade and peel over time. Click here to learn more. 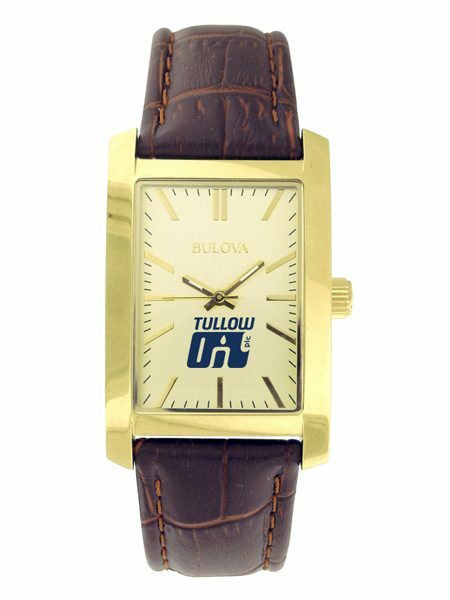 Rectangular champagne dial with stick markers Sweep second hand Gilt-tone bezel Brown leather strap Available in matching men's size Bulova and Caravelle by Bulova custom dial faces are pad printed directly by Bulova factory, which ensures the highest quality reproduction of your logo. Don't settle for inferior digitally printed dial faces, which can fade and peel over time. Click here to learn more. 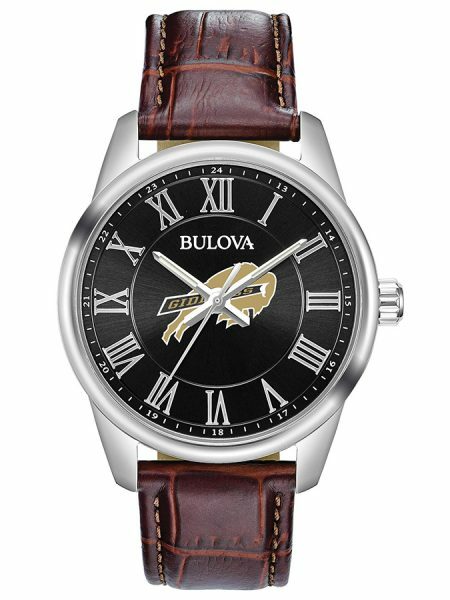 Black sunray dial with silver Roman markers Luminous hands Second hand Brown leather strap 40mm Available in women's size Bulova custom dial faces are pad printed directly by Bulova factory, which ensures the highest quality reproduction of your logo. Don't settle for inferior digitally printed dial faces, which can fade and peel over time. Click here to learn more. 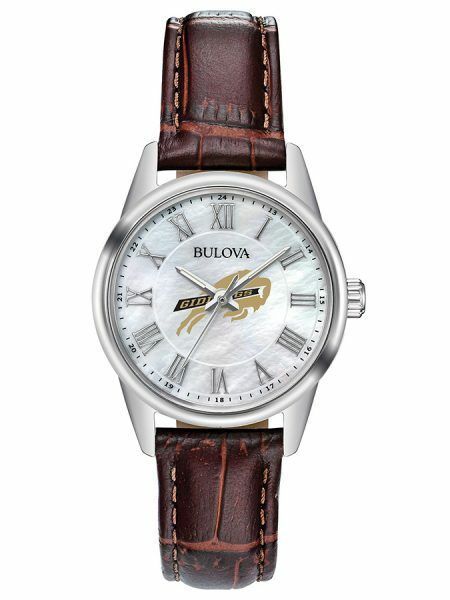 Silver sunray dial with silver Roman markers Luminous hands Second hand Case size: 32mm Brown leather strap Available in men's size Bulova custom dial faces are pad printed directly by Bulova factory, which ensures the highest quality reproduction of your logo. Don't settle for inferior digitally printed dial faces, which can fade and peel over time. Click here to learn more. 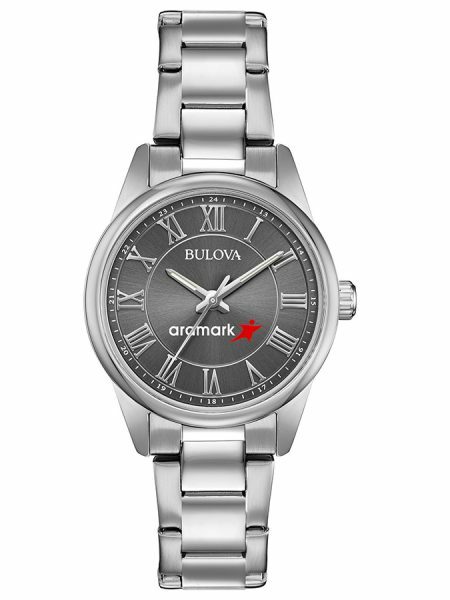 Grey sunray dial with silver Roman markers Luminous hands Second hand Stainless steel bracelet. 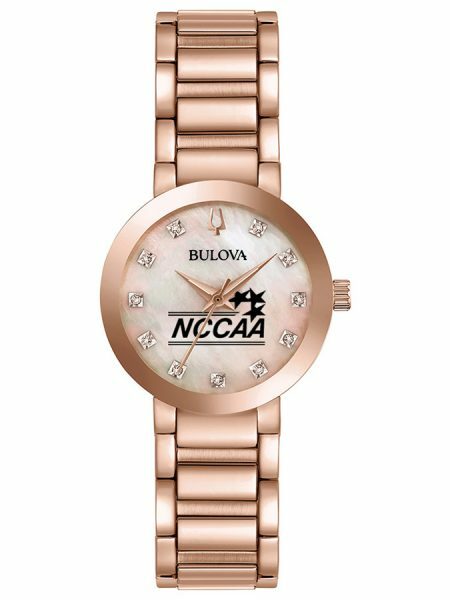 Fold over clasp 40mm Available in women's size Bulova custom dial faces are pad printed directly by Bulova factory, which ensures the highest quality reproduction of your logo. 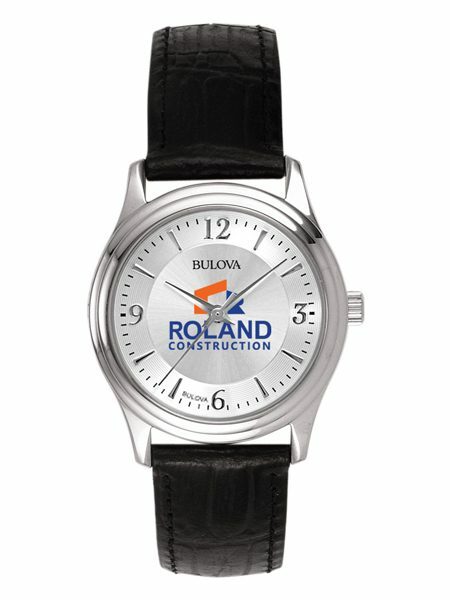 Don't settle for inferior digitally printed dial faces, which can fade and peel over time. Click here to learn more. 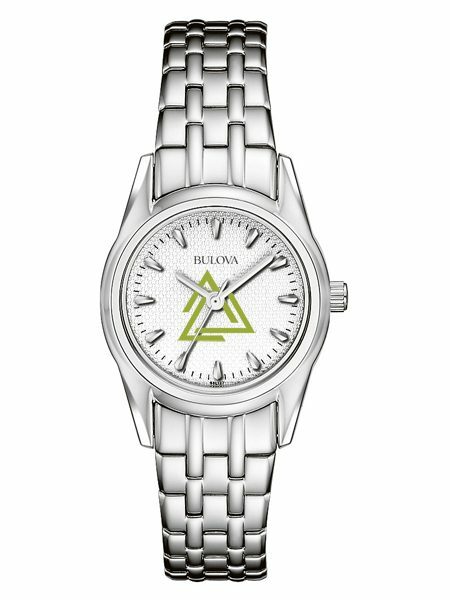 Grey sunray dial with silver Roman markers Luminous hands Second hand Case size: 32mm Stainless steel bracelet Fold over clasp Available in men's size Bulova custom dial faces are pad printed directly by Bulova factory, which ensures the highest quality reproduction of your logo. Don't settle for inferior digitally printed dial faces, which can fade and peel over time. Click here to learn more. Round silver dial with Arabic numbers Sweep second hand Silver-tone case and stainless steel bracelet Case size: 38mm Water resistant to 30 meters Available in matching women's size Bulova and Caravelle by Bulova custom dial faces are pad printed directly by Bulova factory, which ensures the highest quality reproduction of your logo. Don't settle for inferior digitally printed dial faces, which can fade and peel over time. Click here to learn more. 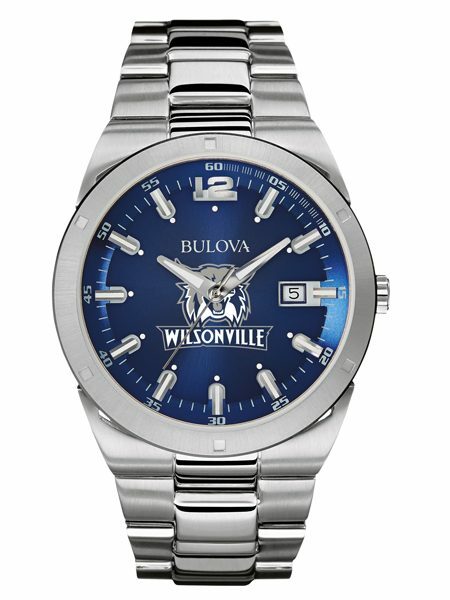 Round silver dial with Arabic numbers Sweep second hand Silver-tone case and stainless steel bracelet Case size: 30mm Water resistant to 30 meters Available in matching men's size Bulova and Caravelle by Bulova custom dial faces are pad printed directly by Bulova factory, which ensures the highest quality reproduction of your logo. 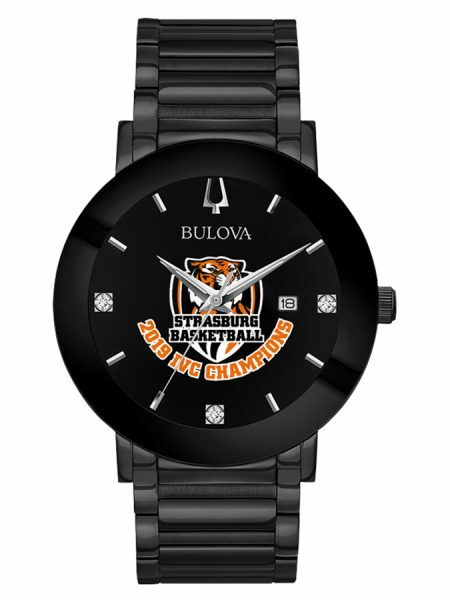 Don't settle for inferior digitally printed dial faces, which can fade and peel over time. Click here to learn more. 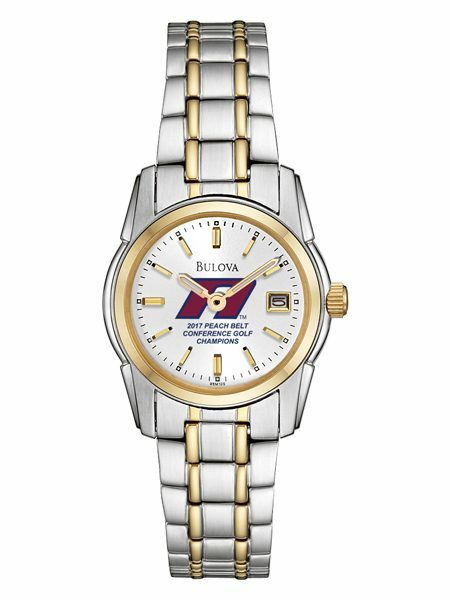 38mm size Stainless steel bracelet with 2-Tone finish Patterned silver dial with gold Arabic & stick markers Double press fold-over clasp Water resistant to 30 meters Available in matching women's size Bulova and Caravelle by Bulova custom dial faces are pad printed directly by Bulova factory, which ensures the highest quality reproduction of your logo. 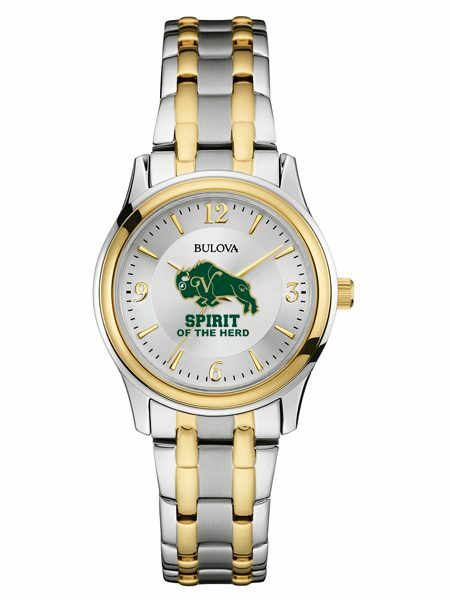 Don't settle for inferior digitally printed dial faces, which can fade and peel over time. Click here to learn more. 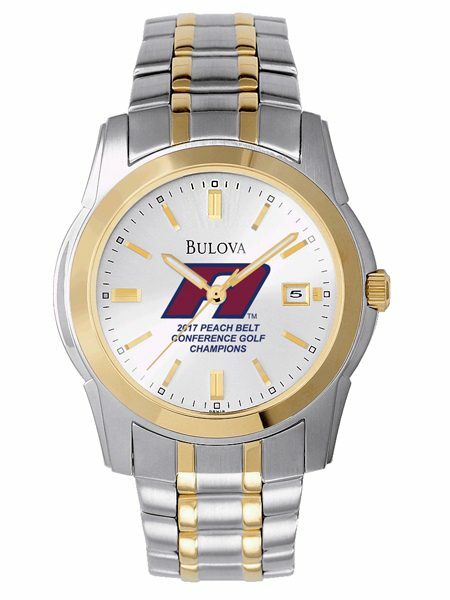 30mm size Stainless steel bracelet with 2-Tone finish Patterned silver dial with gold Arabic & stick markers Double press fold-over clasp Water resistant to 30 meters Available in matching men’s size Bulova and Caravelle by Bulova custom dial faces are pad printed directly by Bulova factory, which ensures the highest quality reproduction of your logo. Don't settle for inferior digitally printed dial faces, which can fade and peel over time. Click here to learn more. 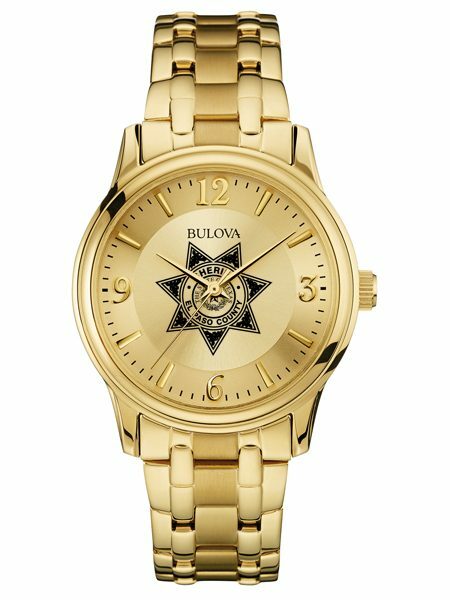 38mm size Stainless steel bracelet with gold tone finish Patterned champagne dial with gold Arabic & stick markers Double press fold-over clasp Water resistant to 30 meters Available in matching women's size Bulova and Caravelle by Bulova custom dial faces are pad printed directly by Bulova factory, which ensures the highest quality reproduction of your logo. Don't settle for inferior digitally printed dial faces, which can fade and peel over time. Click here to learn more. 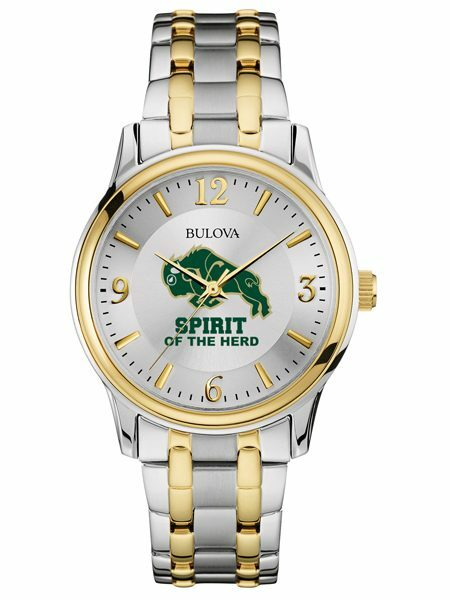 30mm size Stainless steel bracelet with gold tone finish Patterned champagne dial with gold Arabic & stick markers Double press fold-over clasp Water resistant to 30 meters Available in matching men’s size Bulova and Caravelle by Bulova custom dial faces are pad printed directly by Bulova factory, which ensures the highest quality reproduction of your logo. Don't settle for inferior digitally printed dial faces, which can fade and peel over time. Click here to learn more. 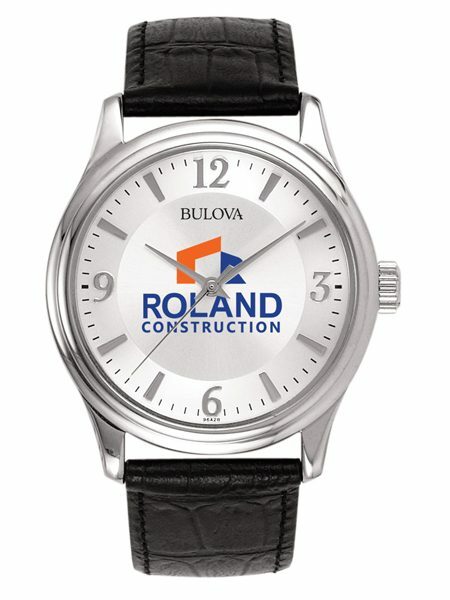 Quartz movement Leather strap; white dial Stainless steel case Case size: 37mm Mineral crystal protects dial Water-resistant to 99 feet (30 M) Bulova and Caravelle by Bulova custom dial faces are pad printed directly by Bulova factory, which ensures the highest quality reproduction of your logo. Don't settle for inferior digitally printed dial faces, which can fade and peel over time. Click here to learn more. 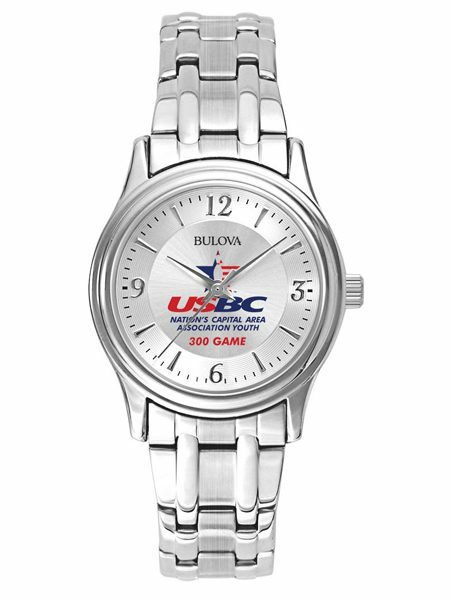 Curved crystal Stainless steel Screw back Fold-over buckle Water resistant to 30 meters Available in matching men's size Bulova custom dial faces are pad printed directly by Bulova factory, which ensures the highest quality reproduction of your logo. Don't settle for inferior digitally printed dial faces, which can fade and peel over time. Click here to learn more. 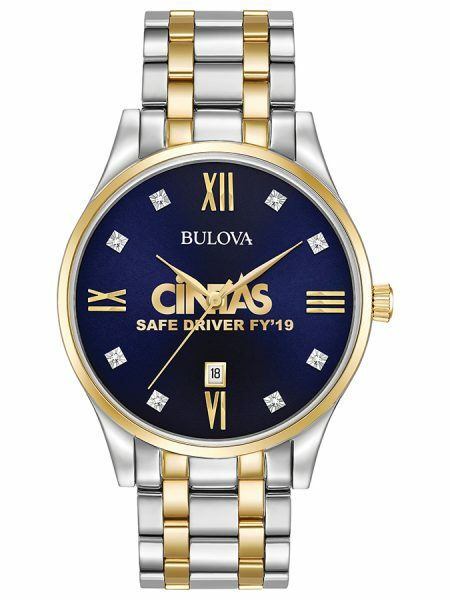 Round dial with raised hour indicators Curved Crystal Stainless Steel casing & band Fold-over Buckle Water Resistant to 30 meters Bulova gift box Bulova custom dial faces are pad printed directly by Bulova factory, which ensures the highest quality reproduction of your logo. Don't settle for inferior digitally printed dial faces, which can fade and peel over time. Click here to learn more. Please add UPS shipping. Round dial with raised hour indicators Curved Crystal Stainless Steel casing & band Date calendar Case size: 43mm Screw back case Water Resistant to 30 meters Bulova gift box Bulova and Caravelle by Bulova custom dial faces are pad printed directly by Bulova factory, which ensures the highest quality reproduction of your logo. Don't settle for inferior digitally printed dial faces, which can fade and peel over time. Click here to learn more. 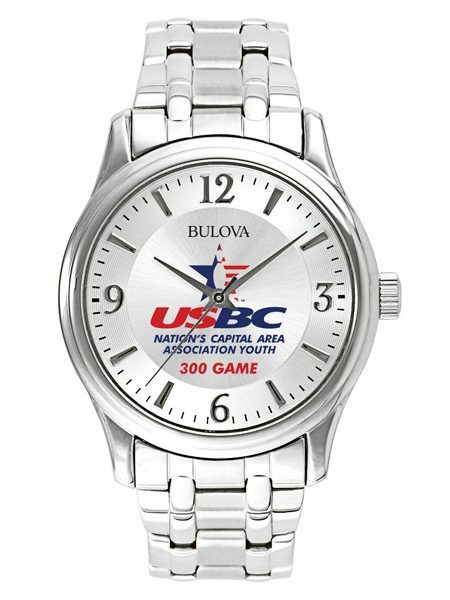 Curved crystal Stainless steel Screw back Fold-over buckle Case size: 40mm Water resistant to 30 meters Available in matching women's size Bulova and Caravelle by Bulova custom dial faces are pad printed directly by Bulova factory, which ensures the highest quality reproduction of your logo. Don't settle for inferior digitally printed dial faces, which can fade and peel over time. Click here to learn more. 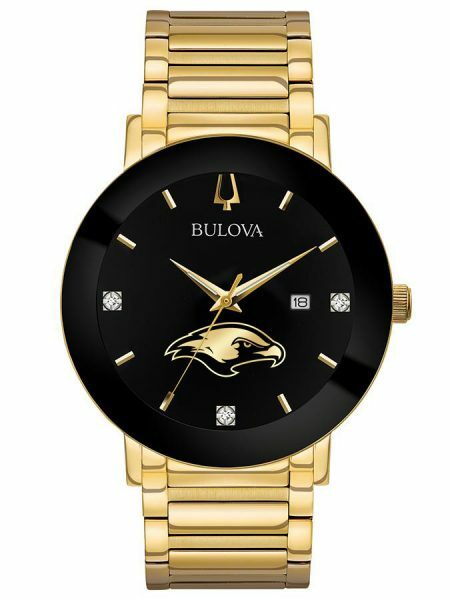 Domed mineral crystal Black dial Stainless steel case and bracelet Case size: 38mm Water resistant to 30 meters Quartz movement Bulova and Caravelle by Bulova custom dial faces are pad printed directly by Bulova factory, which ensures the highest quality reproduction of your logo. Don't settle for inferior digitally printed dial faces, which can fade and peel over time. Click here to learn more. 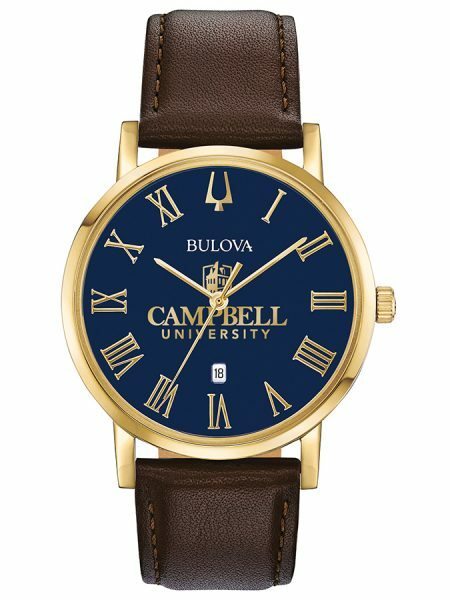 Slim-profile style in gold-tone stainless steel case Dark blue dial with Roman markers and date feature Flat mineral glass Case diameter: 40mm Smooth grain dark brown leather strap with three-piece buckle closure Bulova custom dial faces are pad printed directly by Bulova factory, which ensures the highest quality reproduction of your logo. Don't settle for inferior digitally printed dial faces, which can fade and peel over time. Click here to learn more. 8-diamond blue dial Stainless steel and gold-tone accents on case and bracelet Double-press deployment closure Three-hand with calendar Flat mineral glass Case diameter: 40mm Bulova custom dial faces are pad printed directly by Bulova factory, which ensures the highest quality reproduction of your logo. Don't settle for inferior digitally printed dial faces, which can fade and peel over time. Click here to learn more. 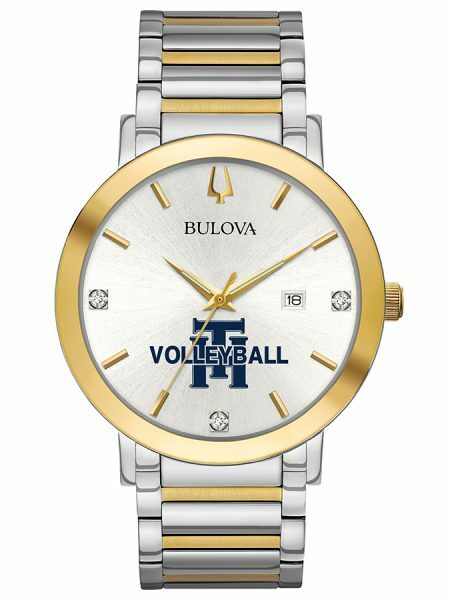 Gold-tone stainless steel case 11 diamonds individually hand set on white mother-of-pearl dial Metalized edge-to-edge domed mineral crystal Screw-back case Case size: 30mm Gold-tone accented stainless bracelet with double-press deployment closure Men's version available Bulova custom dial faces are pad printed directly by Bulova factory, which ensures the highest quality reproduction of your logo. Don't settle for inferior digitally printed dial faces, which can fade and peel over time. Click here to learn more. 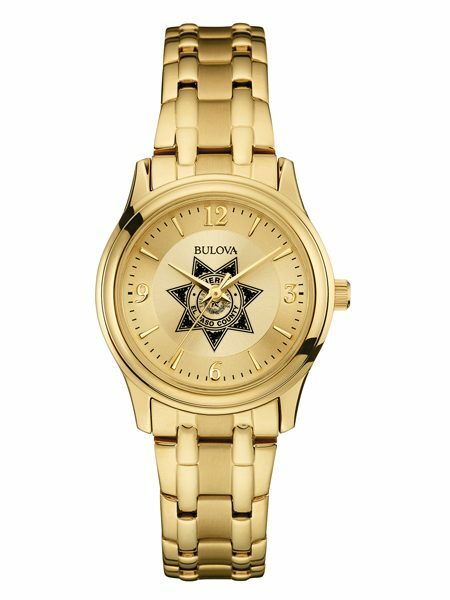 Gold-tone stainless steel case Three diamonds on silver sunray dial Three-hand with date feature Case diameter: 42mm Metalized edge-to-edge curved crystal Screw-back case Two-tone stainless steel bracelet with deployment closure Women's version available Bulova custom dial faces are pad printed directly by Bulova factory, which ensures the highest quality reproduction of your logo. Don't settle for inferior digitally printed dial faces, which can fade and peel over time. Click here to learn more. 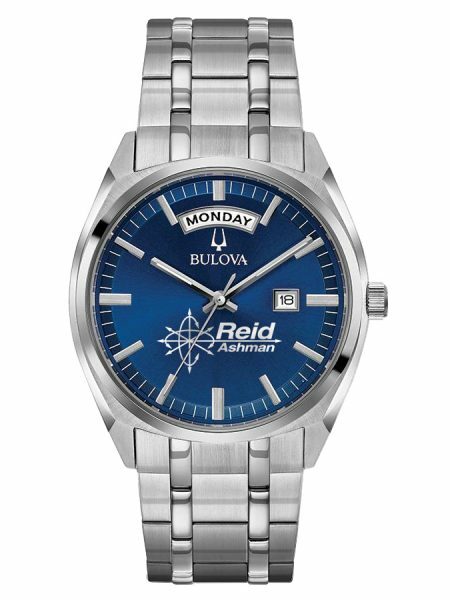 Stainless steel case Three-hand day/date feature Deep blue dial with silver-tone hands and markers Domed crystal Case size: 39mm Stainless steel bracelet with short fold-over double-push closure Bulova custom dial faces are pad printed directly by Bulova factory, which ensures the highest quality reproduction of your logo. Don't settle for inferior digitally printed dial faces, which can fade and peel over time. Click here to learn more. Black IP stainless steel case Three diamonds on black dial Three-hand with date feature Case diameter: 42mm Metalized edge-to-edge curved crystal Screw-back case Black IP stainless steel bracelet with deployment closure Bulova custom dial faces are pad printed directly by Bulova factory, which ensures the highest quality reproduction of your logo. Don't settle for inferior digitally printed dial faces, which can fade and peel over time. Click here to learn more. 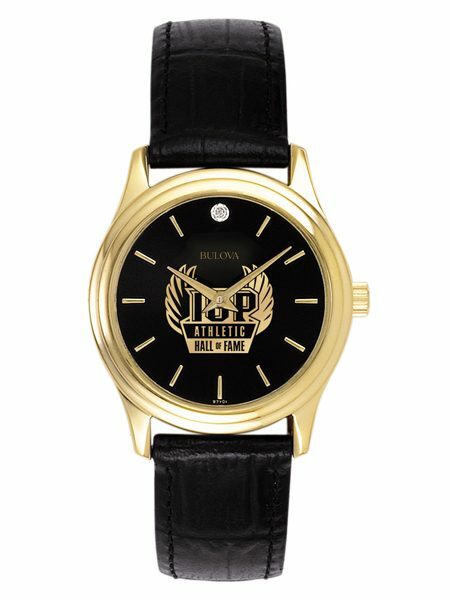 Black IP and gold-tone stainless steel case Three diamonds on black dial Three-hand with date feature Case diameter: 42mm Metalized edge-to-edge curved crystal Screw-back case Gold-tone stainless steel bracelet with deployment closure Women's version available Bulova custom dial faces are pad printed directly by Bulova factory, which ensures the highest quality reproduction of your logo. Don't settle for inferior digitally printed dial faces, which can fade and peel over time. Click here to learn more. 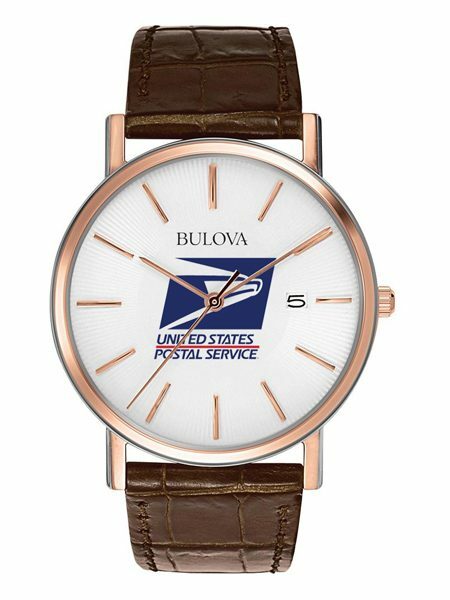 Rose Gold-tone stainless steel case 11 diamonds individually hand set on rose-gold mother-of-pearl dial Case diameter: 30mm Metalized edge-to-edge domed mineral crystal Screw-back case Rose gold-tone stainless bracelet with double-press deployment closure Men's version available Bulova custom dial faces are pad printed directly by Bulova factory, which ensures the highest quality reproduction of your logo. Don't settle for inferior digitally printed dial faces, which can fade and peel over time. Click here to learn more. Solid wood hinged case. High gloss piano finish over mahogany stain. Removable pocket watch with chain & engraveable back. Clear protective lens. 2.5" round brass engraving plate included. 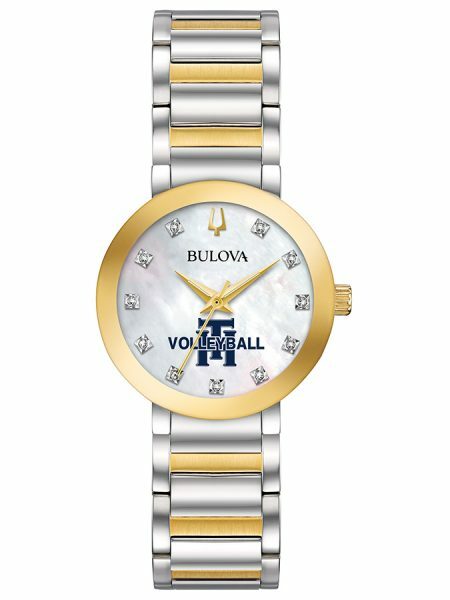 Bulova custom dial faces are pad printed directly by Bulova factory, which ensures the highest quality reproduction of your logo. Don't settle for inferior digitally printed dial faces, which can fade and peel over time. Click here to learn more. Solid wood hinged case. High gloss piano finish over black stain. Removable pocket watch with chain & engraveable back. Clear protective lens. 2.5" round brass engraving plate included. 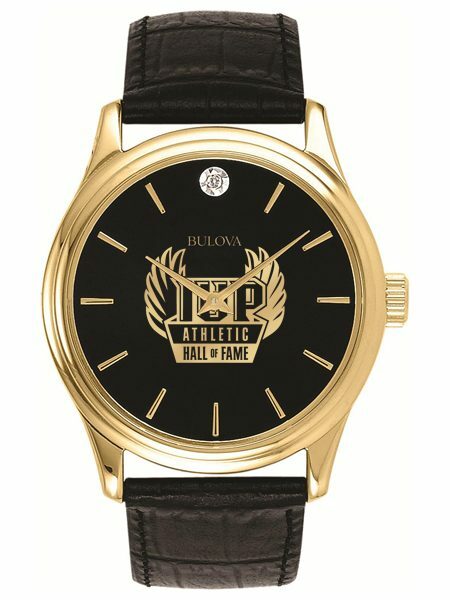 Bulova custom dial faces are pad printed directly by Bulova factory, which ensures the highest quality reproduction of your logo. 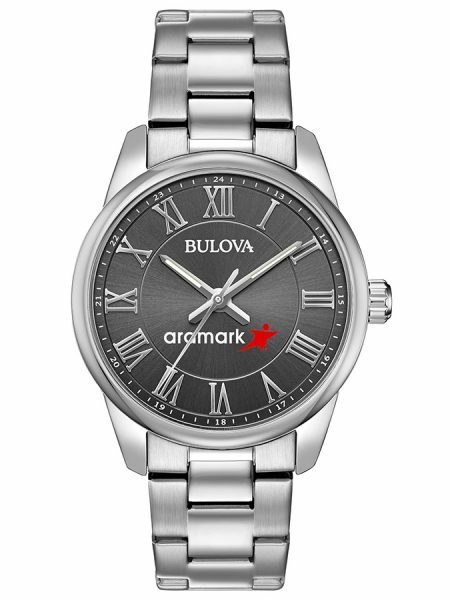 Don't settle for inferior digitally printed dial faces, which can fade and peel over time. Click here to learn more.